A small (up to 430 mm or 17" in total length) snake with 20 or fewer black bands on a cream to light yellow background. Only the anterior-most 1 to 5 black bands do not cross the belly. Between the black bands are soft-edged, red saddles. The red saddles are separated from the black by a margin of cream to light yellow background color. The red saddles are roughly equal in width to the black bands. The snout is cream or light yellow. A black mask crosses the top of the head and covers the eyes. The pupils are round. The underside is cream. The scales are smooth and shiny. With its countersunk jaw, concaved belly, valves in the nasal passages, and relatively flat (slightly convex) snout this snake is well equipped for burrowing under sandy soil and loose gravel. 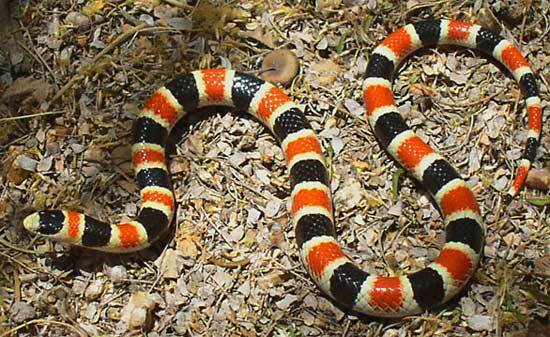 The Sonoran Shovel-nosed Snake's light snout distinguishes it from the similar looking Sonoran Coralsnake which has a black snout. The similar Western Shovel-nosed Snake usually has more than 20 black bands on the body. In Arizona this snake is found only in Organ Pipe Cactus National Monument of western Pima County. The subspecies Chionactis palarostris organica is called the Organ Pipe Shovel-nosed Snake. It occurs ar elevations from about 1,500' to about 2,500'. This snake's range in Arizona is entirely within the Arizona Upland Sonoran Desertscrub community. It is usually found in or near gravelly washes that carve their way through mildly sloping, rocky bajadas. It inhabits terrain that is more rugged and rocky than that of the Western Shovel-nosed Snake. This is a primarily evening crepuscular and nocturnal snake. It is a ground-dweller that is most active in spring. It hibernates during the cold months of late fall and winter. A good burrower, this snake spends most of its time underground. The Sonoran Shovel-nosed Snake feeds on a variety of insects, scorpions, spiders, centipedes, and other invertebrates. Mating takes place in spring. A clutch of up to 5 eggs is laid in summer. ORGAN PIPE SHOVEL-NOSED SNAKE Chionactis palarostris organica.